Aruba Beacons leverage Bluetooth Low-Energy (BLE) technology to power indoor location and wayfinding, and proximity-aware push notifications at enterprises, stadiums, hospitals and other public venues. The ability to customize the placement of beacons ensures a highly engaged customer experience. These small, low-power wireless transmitters broadcast radio signals at regular intervals that can be heard and interpreted by iOS and Android devices equipped with Meridian-powered mobile apps from Aruba and our Meridian Engage app development partners. Aruba 300, 310, 320 and 330 series APs with built-in Aruba Beacons, allow you to remotely manage our 4-year battery-powered standalone Beacons. Not currently running an Aruba wireless network? No problem. 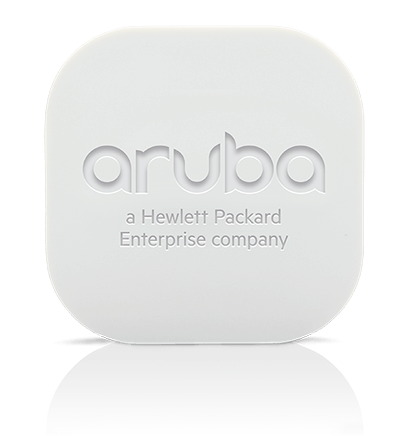 The Aruba Sensor includes a built-in beacon and the ability to manage Aruba Beacons in any wireless environment.